The number of Canadian prisoners placed in isolation has climbed sharply in the last decade — and continued to rise after the high-profile death of teen inmate Ashley Smith put the dangers of segregation in the national spotlight. Statistics obtained by CBC News Network's Power & Politics under access to information laws show there were 8,221 admissions into segregation in 2012-13 — up from 7,137 in 2003-04. 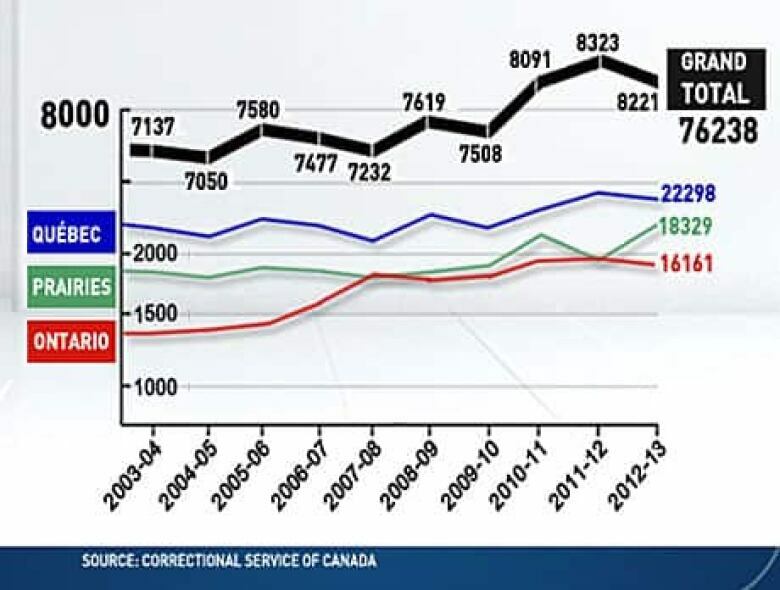 The figures, provided by the Correctional Service of Canada, show the greatest increases were in Ontario, Quebec and the Prairies. 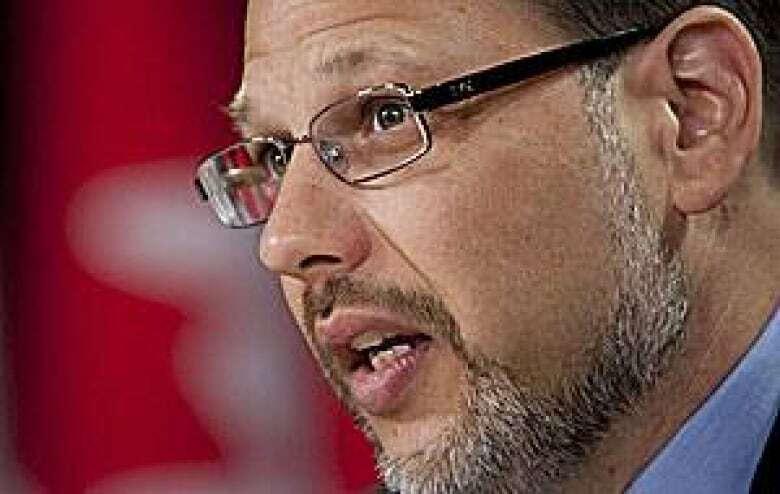 Canada's correctional investigator, Howard Sapers, told CBC News he has "serious concerns" about the overuse of segregation, its impact on vulnerable inmates and ultimately on rehabilitation and public safety. "Segregation is an inappropriate way to deal with prison population management pressures. The law requires that the Correctional Service of Canada use the least restrictive means of custody, the least restrictive means necessary in terms of managing risk," he said. "So some offenders may have to be segregated — but certainly not as many as we're seeing and not for the length of time that we’re seeing." Risk management or population management? When the inmate jeopardizes the security of the institution or safety of another person. If allowing the inmate to associate with others could interfere with a criminal or serious disciplinary investigation. If the inmate’s association with others could jeopardize his or her own safety. But Sapers said there has been an "over-reliance" on segregation to deal with other prison problems — and that it has become more of a population-management tool than a risk-management tool. "Canadian penitentiaries are becoming very crowded, and when they are crowded they are much more difficult to manage," he said. Sapers also raised concerns that a disproportionate number of aboriginals, offenders with mental health issues and women are held away from the general prison population. "Segregation units are being used to house a marginalized, compromised, vulnerable population," he said. "Some of those folks may need medical supervision and instead they're getting security supervision in a segregation cell. And the result of that is we're seeing a rise in the number of self-injury incidents in segregation, attempted suicides in segregation and completed suicides in segregation." An inquest into the death of Ashley Smith heard expert testimony on the harmful effects of prolonged isolation, and how mentally ill prisoners often wind up in segregation instead of getting proper treatment. Sapers said he expects some of the recommendations that ultimately come from that inquiry when it resumes next month will be around the use and monitoring of segregation. "There have been policy changes and new training, but we have not seen a decrease in the use of segregation since Ashley Smith's death. If anything, we've seen an increase," he said. Sapers said isolation exacerbates existing mental health conditions and can create anxiety, depression and sleep disorders. In a statement to CBC News, the CSC said the rise in segregation admissions can be attributed to an increase in the total prison population and to a more diverse and complex inmate population. "The complexity of the offender population has been documented in CSC reports consistently since 2005, and offenders with more extensive histories of substance abuse, violence, gang affiliations and weapon use have characterized the federal offender population since that time," said Lynn Brunette. Brunette added that the more recent rise in segregation numbers would be affected by "improved contraband detection capacity" since 2009. Catherine Latimer, executive director of the John Howard Society of Canada, said segregation has become a means of managing mentally ill offenders. "They tend to deal with difficult inmates by putting people in administrative segregation — particularly people who are frankly difficult to control in the prison population because they have mental health issues," she said. Latimer said a number of legal challenges have been mounted in Canada and the U.S. against the broad use of segregation, especially for younger offenders and those with mental health problems. In California, human rights advocates and celebrities such as Jay Leno, Rev. Jesse Jackson, Bonnie Raitt and Gloria Steinem have condemned the solitary confinement of inmates, and have written to the state's governor calling the units "extensions of the same inhumanity practiced at Abu Ghraib and Guantanamo Bay." Hundreds of prisoners have been on a hunger strike to protest the practice. Sapers said there have even been incidents of double-bunking in segregation cells in Canada because of overcrowding. CSC is creating 2,700 new cells to add capacity, but Sapers questions whether they will be used in a way that eases the reliance on segregation. "One of the sad realities of corrections is that we tend to fill the space when we have it, so I expect we could be having this conversation five years from now…. about the need for enhancing capacity, training, policy and accountability and monitoring," he said.